OK – we’re the first to admit that India is not part of Africa! But, India does offer some high quality safari options across the sub-continent, as well as some unique wildlife and terrains that you can’t see in Africa, hence the inclusion of India in this wesbite! India has a wide network of national parks, from the Indian Ocean to the Himalayas. Parks are run by the state tourism department. All Indian national park lands encompass over 38,000 km², which is around 1.16% of India’s total area. 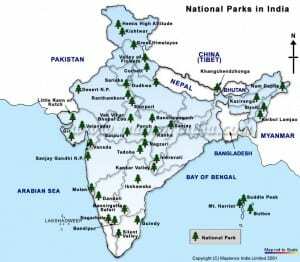 As of 2007, there were 96 national parks in India. Bandipur National Park, Karnataka: In the foothills of the Western Ghats, Bandipur covers 800km sq of dry deciduous forest. Bandravgarh National Park, Madhya Pradesh: Sal forests and savannahs in central India offering the some of best chances for tiger spotting in India. Corbett National Park, Uttarakhand: The daddy of India’s wildlife reserves, famous for it’s big cats and elephants. Dibru-Saikhowa National Park, Assam: One of the few national parks in India where wild horses can be spotted. Dibru-Saikhowa also offers plenty of birdlife. Gir National Park, Gujarat: Extinct in the rest of India for over 100 years, Gir National Park is home to over 300 Asiatic lions. Gorumara National Park, West Bengal: Off the beaten track Gorumara is a varied habitat from grasslands to dense jungle, and watchtowers to spot the rare one horned rhinos. Kaziranga National Park, Assam: A stunning park that’s one of the last remaining places to spot the one horned rhino. Kanchendzonga National Park, Sikim: Unbelievably the park is mostly unexplored by man, and home Kanchendzonga – the world’s third highest peak – as well as snow leopard, Himalayan black bear and the red panda. Kanha, Madhya Pradesh: Regarded as India’s greatest National Park, Khana provides 940km sq of beautiful savannah, deciduous forest and grasslands. Keibul Lamjao National Park, Manipur: Comprising 40km sq of wetland overgrown with 1.5 m. deep floating phumdi vegetation and Loktak Lake, the largest freshwater lake in India. Keoladeo National Park, Rajasthan: One for the twitchers, Koeoladeo is India’s premier bird watching locations with wetlands home to some 375 bird species. Manas National Park, Assam: Large animals can be tough to spot, but Manas is a stunning combination of sand, grass, sal forests and river bordering Bhutan. Mahatma Gandi National Marine Park, Andamans: 15 islets with perfect white beaches and access to one of the richest coral reefs in Asia. So out of the way as to almost have the place to yourself. Nagarhole National Park, Karnataka: Classic jungle scenery with high canopy, home to large numbers of animals. Prime viewing time is February to June. Namdapha National Park, Arunchal Pradesh: A beautiful park in a pristine setting straight out of the pages of Tolkien, and among the last large tracts of wilderness in south Asia. Neora Valley National Park, West Bengal: Set in the eastern Himalaya the Neora Valley offers pristine natural habitat with rugged inaccessible, hilly terrain and rich diverse flora and fauna. Palamau National Park, Jharkhand: Sal tree forests covering a hilly terrain in remote central India with rare tiger sightings. Rajaji National Park, Himachal Pradesh: 830km sq of beautiful Himlayan foothill scenery, home to wild elephants and elusive leopards. Ranthambore National Park, Rajasthan: A classic stop for tiger spotting, Ranthambore has camera friendly tigers and plenty of tourists to snap them. Sariska National Park, Rajasthan: Relatively unvisited poor relation of nearby Ranthambore – less tigers but other wildlife is abundant, and the crowds are smaller too. Silent Valley National Park, Kerala: A mixture of tropical evergreen forest and highland grasses, the Silent Valley is considered one of the most ecologically diverse areas left in the world. Similipal National Park, Orissa: Search for tigers, leopards and elephants high up in the Megasani Hills. Sundarbans National Park, West Bengal: UNESCO World Heritage site of swamps and mangroves, home to the famous swimming, man-eating royal bengal tigers. Velavadar Naitonal Park, Gujarat: Small national park with an interesting selection of mammals, including the Indian wolf, Indian fox and jungle cats. Self drive safaris are occasionally an option in India, depending on which national park you’re visiting. However, the chances are you’ll need to take a tour at some point with one or other of these safari tour companies in India. Have you been to a national park in India, or got some useful information you’d like to share on the topic? Please feel free to get involved in the comments section below.